Here you will get the CBSE Class 9 Science Solved Practice Paper for the Summative Assessment-II, 2016-2017. The paper is composed of all fresh questions that are quite important from exam point of view. Every question is provided with an apt explanation. It will also make you familiar with the latest CBSE Exam Pattern. Jagranjosh.com, India’s leading education portal, presents CBSE Class 9 Science Solved Practice Paper for Sumamtive Assessment-II, 2016-17. This practice paper is specially prepared by the subject experts after the brief analysis of previous year question papers. The paper contains entirely fresh questions picked from the most important topics of Science. All the questions are provided with an apt explanation. This paper will help the students in understanding the depth with which a topic should be studied in order to prepare in a more effective way to get the desired results. This Science SA – II Practice Paper for CBSE Class 9, is set as per the latest CBSE exam pattern and aims at helping the students to prepare for the exam more effectively so as to get the desired results. Taxonomy is a branch of biology that deals with the classification of all living organisms. Q. A person hears an echo from the top of a tower, 2.4 seconds after the sound is produced. How far away is the tower from the person? Speed of the sound in air is 332m/sec. = 138.33m is the distance. Q. Define pressure. State its SI unit. Why is it easier to cut an apple at sharp edge? Pressure is the force acting perpendicular per unit area. It’s SI unit is Pascal (Pa). A sharp knife has a very thin blade. When our hands apply force on this blade a large pressure is generated on the apple. This pressure cuts the fruit effortlessly. Q. Differentiate the nature of skin in four classes of tetrapoda. Mammal: They possess multi-layered skin like dermis and epidermis. Hair and glands are present on the skin. Ave: The skin is covered with feathers which are made of hard keratin and two layers of dermis and epidermis. When compared to mammals, the epidermis is thin and delicate, and glands are absent. Reptile: They have dry skin with the presence of hard scales. They also show ecdysis, a condition where the animal sheds off his skin. Amphibian: They have moist and delicate skin which is permeable for water. Mucous glands are present on the skin. Q. Momy and Lizy are friends and they study in the same class. Lizy brings home-made food as tiffin to the school, whereas Momy eats burger, chips and french fries during tiffin break from school canteen. During a routine health check-up in the school, the doctor finds Momy overweight to her age. Both Momy and Lizy have read that overweight leads to diabetes and cardio-vascular diseases. Both of them now want to help other students so that no student could suffer from overweight. (a) What should Momy do now to keep her weight under control? (b) How can two girls help other students? (c) What values are shown by Momy and Lizy? (a) Momy has to stop eating the junk food of canteen and bring home-cooked food instead. She should also get involved in some kind of exercise or physical activity that would help her reduce weight. (b) The two girls can either give a presentation in the school auditorium or organize a play to let their fellow-students know the dangers of eating fatty foods or too much food. They also need to educate them that even children can get diabetes and cardiovascular diseases. (c) This shows that Momy and Lizy are smart, alert and caring girls. Q. (a) (i) Name the reproductive organs of gymnosperms and angiosperms. (b) (i) Distinguish between Monera and Protista on the basis of nucleus. (ii) Classify Flying lizard, King Cobra, Frog, Salamander, Ostrich, Pigeon, Bat, Crocodile and Whale into the cold-blooded/warm-blooded animals. (b) (i) In monera, the nucleus is not defined and is not enclosed by nuclear envelope. On the other hand, in protista, the nucleus is well-defined and enclosed by nuclear envelope. The shape of the surface matters when it comes to reflection of light. A flat or a plane surface reflects sound waves at an angle at which the wave approaches the surface. Q. 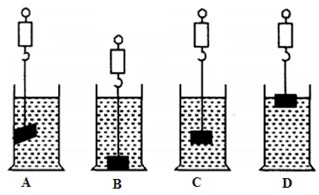 Which of the following diagrams represents the correct way of finding the weight of a solid in water? Q. To verify the laws of reflection of sound, why is it important to have a smooth reflecting surface? When sound wave is incident on a rough surface, some part of it is reflected and some part gets absorbed by that surface. Whereas a smooth reflecting surface reflects the sound waves in such a way that the angle at which the wave approaches the surface equals the angle at which the wave leaves the surface. Hence, the sound that you hear through the pipe depends on the nature of the reflecting surface and thus, it is important to have a smooth reflecting surface.